This week has been a rough one for me doing the #CommitToFit Challenge. 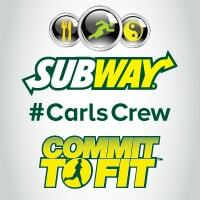 Carl Savard, SUBWAY Canada Commit to Fit ambassador, emailed us our week 3 challenge – Squats. Eeek! I haven’t done squats since Olivia was a baby. That was over 16 years ago! Back then I was in great shape. I ran, lifted weights and loved to exercise. Things changed for me 10 years ago when I developed chronic pelvic pain. I miss the way my body used to work and how great I felt getting into shape. With that said, I wasn’t giving up. I didn’t know if I’d be able to do the full amount of squats that Carl suggested, but I figured I’d modify the number to suit my condition. I realized that I’m soooo out of shape. My muscles are so weak from the years of just doing the bare minimum for exercise. I attempted squats every day, but had to play it by ear based on my pain levels for that particular day. On “good” days, I was able to do more. On “bad” days, I could barely do one. I did so well on weeks one and two and am little bummed that week three was so tough for me. I guess I’ll take the good with the bad and give myself credit for at least trying. Do you incorporate squats into your exercise routine? Connect with SUBWAY Canada on Twitter and Facebook. I try to do squats as often as possible. No I don’t do squats , have to be really careful of my back. No, because I hate exercising. Yes! I exercise daily, i even have my four year old son do it with me before bed time! Squats included. Helps with “buns of steel”.